When it comes to being creative, skating, and fashion, Serenity is the right gal for the job; as she can be seen shredding the skate park with friends and looking fashionable when doing so. 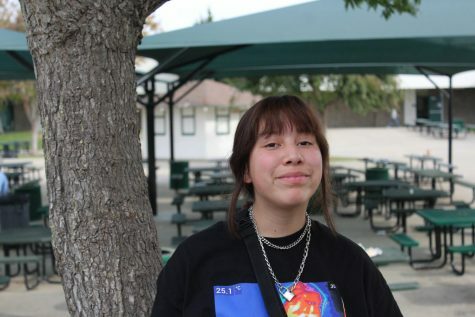 Serenity Espinoza was born in Merced and later on moved to Salinas, where she grew up on liking the 80s and being taught by her father how to work on cars. Serenity also enjoys being in acting clubs, getting herself in the leading female role for Fahrenheit. She loves watching broadway and movies like Heathers and 16 Candles, so she really gets her best acting skills from these movies she favors a lot. She also looks up to Johnny Depp because he inspires her in that he can literally be a character in any movie, which Serenity concluded that he is such a “versatile” actor. Acting is one big concept in Serenity’s life and she can let her inner self out through acting. Serenity is also a huge fan of music and when it comes to her favorite music bands, her favorite would be Brockhampton. Brockhampton is a mixture of genres of hip-hop, alternative R&B, and pop. I believe that Serenity has a good taste in music because she likes bands that are a mixture of genres. She says it’s better to like this type of music compared to the crap being put out nowadays like with these new rappers in which they repeat the same word over and over. Serenity also has a very wild side and an athletic side, so she has some talents. One is archery, which she started in the 7th grade. Serenity is not someone you would want to mess with, she can also play piano and knows a thing or two about cars, heck she can probably fix your car if you asked her. Serenity also joined sports like tennis, track, volleyball, and ballet. She also likes animals and she supports them by being a vegetarian. All in all, Serenity is a good mindful person with a great personality.